Krishna is 40 year family man with a 7 years old daughter . His wife is a homemaker. He was detected with ALL , a type of blood cancer in 2014. He underwent chemotherapy and Bone marrow transplant . Expenditure was in tune of Rs 50 Lacs . He had to sell his ancestral property to pay for the medical expense . On 20th June 2017 in his medical check up blood cancer was detected again . 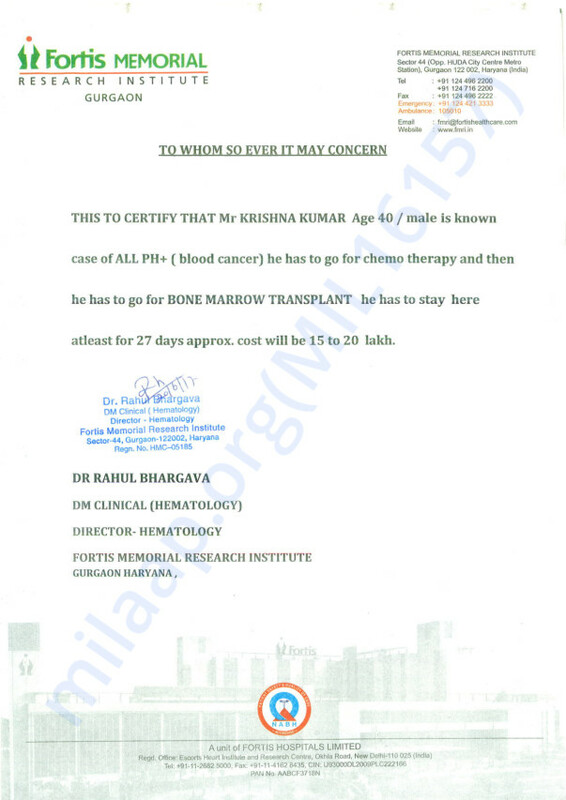 He has to undergo the whole process of bone marrow transplant which was done earlier. Expenditure involved is in tune of Rs 30 lacs, excluding post BMT expenses. He has now no other financial resource to take care of his medical expenses. In blood test done on 7th July 2017 it was observed that cancerous cells have come back again in his blood . Krishna had to purchase anti cancer drug Ponatinib cost of which is in tune of Rs 4.5 Lacs for 60 tablets which will be consumed in 20 days. (Invoice and custom duty paid slip appended ) . At this moment Krishna is admitted in Hospital , he got admitted on 27th Sept 2017 , to get bone marrow transplant done . 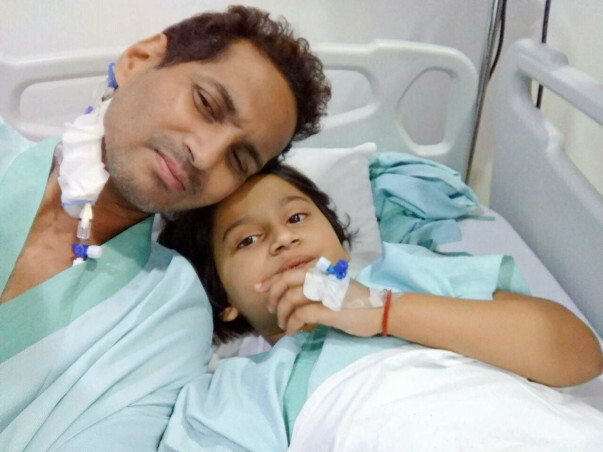 Bone marrow transplant is the only ray of hope to save Krishna's life. His lovely daughter Kavya , ( in the picture above ) will be donating her bone marrow . We request you to kindly extend financial support . Though the amount of expenditure involved is huge , any amount of contribution will be greatly appreciated. You will be contributing to save a family and ensure a living father for the 7 year old daughter. The BMT transplant has been done on 4th October. Thank you all for the support! Doctors will get bone marrow test and BCR ABL done. Post analysis of the results they will decide on date of Bone Marrow transplant. Meanwhile Krishna is carrying on with medicine Ponatinib 45 mg per day. Thank you for the support you have shown so far. We are confident that your love and support is helping Krishna be brave in this difficult time. However, lack of funds has been a cause of worry to Krishna and his family. Here's how we are doing our bit to help them. To help raise the funds faster, Milaap Impact Partner will match 25% of every contribution from today till 31st July. Which means, for every 1000 INR you contribute, Milaap Impact Partner will contribute 250 INR thereby creating 1.25X impact. So contribute and spread the word to support Krishna! Our prayer to almighty God to bless Krishan, a healthy and prosper life .. all the best Krishan, don’t worry everything will be fine.. it’s tough time but for sure you will overcome from this and you will be fine. God bless!